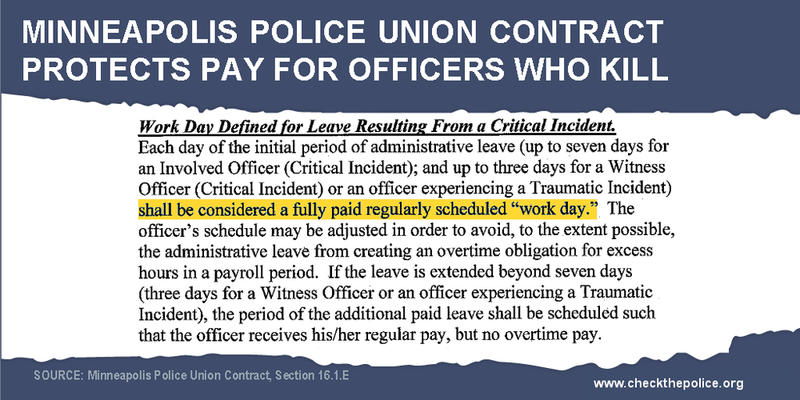 Learn how police union contracts make it more difficult to hold police officers accountable for misconduct. Limiting disciplinary consequences for officers or limiting the capacity of civilian oversight structures and/or the media to hold police accountable. We reviewed police union contracts and police bill of rights legislation to examine how they make it more difficult to hold police accountable. We reviewed the police union contracts of 81 of America's 100 largest cities* and police bill of rights in all 15 states with such legislation to identify the ways in which these policies make it more difficult to hold police accountable (Download Summary Report). Click the orange boxes below to view details for each policy. *Birmingham, Chesapeake, and San Bernardino refused to send contracts. The remaining 16 cities do not have police union contracts. 72 of 81 cities' contracts and all 14 states with police bills of rights were found to impose at least one barrier to police accountability. 63 cities and 12 states had three or more provisions imposing barriers to accountability. Only Aurora, Boston, Chula Vista, Dallas, Denver, Fremont, Fresno, Long Beach, and Nashville did not contain problematic provisions in their police union contracts. 25 cities and 6 states disqualify certain complaints from being investigated or resulting in discipline, for example if they are submitted too many days after an incident occurs or if an investigation takes too long to complete. 50 cities and 14 states restrict interrogations by limiting how long an officer can be interrogated, who can interrogate them, the types of questions that can be asked, and when an interrogation can take place. 41 cities and 10 states give officers under investigation access to information that civilians suspects don't get, including 16 cities that allow officers to review all evidence against them prior to being interrogated. 64 cities and 10 states limit disciplinary consequences for officers, for example by preventing an officer's history of past misconduct from being considered in future cases, and/or limit the capacity of civilian oversight structures or the media to hold police accountable. This includes 48 cities that let officers appeal disciplinary decisions to an arbitrator who has the power to reinstate that officer and who in many cases is selected, in part, by the accused officer or the police union. 40 cities and 3 states, in their contracts and bill of rights, require cities to pay costs related to police misconduct including by giving officers paid leave while under investigation, paying legal fees, and/or the cost of settlements. 43 cities and 4 states erase records of misconduct, in some cases erasing records after 2 years or less. 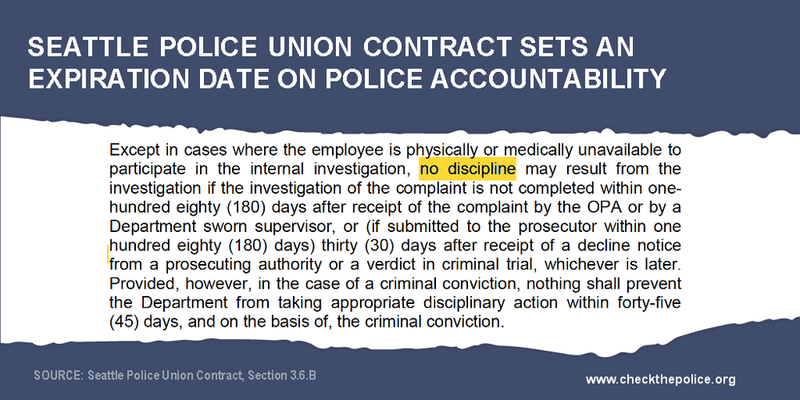 Examples of police union contract provisions that block accountability. Email sam@thisisthemovement.org or deray@thisisthemovement.org to get involved in collecting information on and/or reviewing police union contracts in your area.